1. What is CCN and what sets it apart from the rest of the of comic-centric news and opinion sites that already exist? The current slate of news sites are centered around corporate-owned Intellectual Properties and their management of those IPs, and not the blood, sweat and tears of the individuals who are pouring their blood into these stories. The current status quo is that the Creators are expendable and they have no options and no Voice. 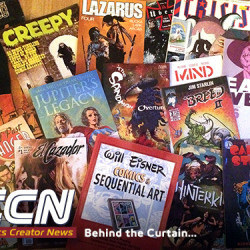 CCN will be centered around individual Creators, their creations, and will actively report on those creator-owned projects that are so important to them that they won’t give up ownership of their ideas. Simply put, CCN is about Creators not Corporations. 2. Let me play Devil’s Advocate for a moment, if I may, and ask why you’d willingly limit your coverage like that? I mean, what’s left to cover if you’re not talking about the Big Three imprints of the Direct Market? And how does that approach better serve the reader, much less the creators, publishers, distributors and shops, not to mention the medium itself? Earlier in the comics medium, creators had better access to reporters of integrity. Journalists that researched the background and history of the medium. There is a very distinct break where the reporting became irreverent, arrogant, and disinterested in the facts. Much of that has to do with the changing nature of “news” into popular culture entertainment. It’s been a remarkable dumbing down of what is being labeled as information. The other half of that is the out-right purchase and control that Entertainment Corporations have exerted over the content of “News” sites. AOL, MTV, G4…these are Corporations with their own agendas. They are not interested in individuals, or individual visions only in controlling the content for financial gain. The readers deserve a more honest approach to creativity. If you are irreverent of all creators and the entire history of the medium, you can report anything as the truth and no one will question it. That’s where we are currently at as an industry. 3. Where’d the idea for the site come from, and why did you take on the challenge of making it a reality? The idea was spawned out of my frustration at news sites directing me to their Spam filters. That started in the most impersonal manner while physically standing in front of one of these so-called “reporters”. It took awhile to mentally jell, but the realization came that these Internet trolls were controlling the flow of information in this industry. That creators were actually not important to their business model as they are only interested in the advertising dollars from the large corporations…and these “news” sites are actively sacrificing their integrity in the process. It seemed to me like a pyramid scheme where the all the various news sites are supporting the agenda of huge corporations on their backs. Seriously? If not me…then who? It didn’t get this way by chance! Excellent reporting had been done for decades by print journalists at The Comics Journal, Tripwire, Comics Interview and many others. Those publications were very slow to segue to digital delivery and the 24/7 Internet style. It broke their companies, and removed them from the instantaneous comics zeitgeist of today. Despite the quality of the reporting, news that was delivered on a monthly or even weekly basis (like the industry newspaper, CBG) was OLD news by the time readers got it. The Internet changed the equation, and the access to readers who wanted to be a part of the industry, had a computer, and had an opinion could easily supplant actual reporters. Many of those commentators were quite good, and many just plain…were not. The added out-sourcing to a mass of writers that would work for Free, simply to be a part of this industry instantly lowered the bar on the quality of the reporting. They were told to learn their chops before they could earn those pork chops. 5. Well, who else is involved, and what are they contributing to the cause? There is the industry’s premier comics reporter, Robert J. Sodaro who has been writing about comics professionally since 1989. Bob is infinitely versed on comics and the associated media, merchandising, and the creative process. He brings a media studies, and journalism background to the process alongside his own experience as a creator and author. We’ve also raided the staff of Publishers Clearing House for their brightest talent, giving an outlet to an enormously talented new-comer, SuperMattKelly! Matt’s got a great marketing and promotions background, writes prose short stories, and delivers his very own steam-punk legend in Anabelle Avery! We are in discussions with Brigid Alverson, who brings a wealth of experience and over a decade of journalistic background. Brigid was recommended for her remarkable ease with diverse material, and her insights alone on all-ages material and it’s history are vast. We would be incredibly honored to add her expertise, style and reporter’s instinct. 6. Given your deep and widespread connections within the comics business and its affiliated industries, you could have tapped just about anyone for those slots. Which begs the question of why did pick you those particular individuals? Setting aside my small contributions, what unique abilities or attributes made these writers the perfect pick for the site? I think it was synchronicity?!? We wound up at Wee Molly’s (www.themollywee.com) after the 2013 BookExpo, and were just throwing ideas at the dartboard. Something stuck in my mind, and it was that if all the news sites are vapidly running the same PR/pre-arranged story…where was the actual news? 7. Well, how can everyone else get involved? Obviously, you’d like a loyal and growing fan base, but what about creators, publishers, editors and convention and signing organizers? Are there ways that they can get their work considered for review, and their pr and other announcements posted? My suggestion would be to come by the Atlas Unleashed booth (#1347) at NYCC, and introduce yourself. We always like meeting creators, editors, and industry pros. If you have a business card, drop it in our contacts jar, and show us what you’ve got going on. Chances are if you are excited about the project, it’ll be infectious! If you’re not coming to NYCC, drop us an email here at “Was UP?” with a headline of “4UR Consideration…” and your contact information (email; phone number; web address, etc…). We understand how most professionals don’t want to promote a project until it’s in the bag, and we’re ready for the PR steps when you are. Of course, an online link to the work always helps, too. 8. And what about journalists? Will you be expanding both your coverage and your bullpen at some point, or will CCN largely remain a bare bones affair? I fully expect some of the journalists out there to be on the same page as us…it’s what is Great about Comics! That spark of creativity…once they experience the lightning, it’s hard to keep quiet about. I still don’t remember the reporter’s name that reviewed “Superior Foes of Spider-Man”, but I wish that I did! The review of that book made me want to give a book that I easily ignored a chance…and Nick Spencer is delivering a great Story month in and month out. That review was posted on The ComicsBeat (http://comicsbeat.com), btw. 9. What are you all trying to achieve with your combined efforts? Do you have any short or long term goals you’d care to share? Yes. Frankly I’m not trying to replace sites like Newsarama or other “Pop Culture” entertainment destinations. What I am trying to do is get Creators to open up about their projects that make doing this all worthwhile. I’m trying to unbridle the stallions, and oxen and allow them roam free as it’s obvious that they are NOT happy with the treatment they are getting. Not every corporation is the evil empire, but some have the Emperor’s lawyers screwing creators left and right. It’s not a secret, it just doesn’t have a platform yet. 10. What do you hope that your contributors get from their efforts? That’s where you see a difference between reporters, journalists and the desperate amateurs. An amateur doesn’t understand why they are doing things, and the professionals always understand what is worth doing. I’d like to think it’s journalism about an industry that you have a vested interest in, and actually care about the future well-being of. Some of those early internet reporters have already moved on to the creative side as screen-writers, television writers, or taken positions as internal communications directors! My hope is that my contributors enjoy talking with creators, and expressing the creator’s viewpoints…something which seems to have been shut down of late! 11. And what about that most important group, your readers? What do you hope that they get from CCN? A clean breath of Fresh Air! 12. How about you, Mark? What do you get from doing all of the work associated with the business of running the site—aside from fame, fortune and all the trimmings, of course? What does running CCN provide that you don’t currently get from the day job or your other creative efforts as a writer and publisher? There is a great deal of satisfaction in knowing that I’ve helped lift the crushing weight of intimidation coming from some quarters. This wouldn’t be worth doing if everyone else was giving these creators a chance to express their excitement about creator-owned projects! I’m trying to invert the pyramid here…90% about creator-owned, creators and their experience, and just a sliver about the companies. It really is all about their creative work. 13. Anything you’d care to add before I let you get back to work? Yeah, support the independents! BOOM, Archaia, Red Anvil, Titan Books, Magnetic Press, First Second, IMAGE, Oni Press, Top Shelf Productions… There are so many great books that are about Story and not corporate trademark protection. Go read some Madefire digital ebooks, and fund a Kickstarter…you’ll be glad you did! With special thanks to the creator who made this industry seem like the infinite worlds of wonder that we know and love…Mr. Don McGregor!